Lovingly researched backgrounder on a more-fascinating-than-you-can-ever-imagine song. Pulitzer Prize–nominated AP reporter Anthony believes that “House of the Rising Sun,” best known in the version recorded by British blues-rockers the Animals, is one of the most vital pieces of music in American history. So he crisscrossed the U.S. to find out all about the tune. His travels took him from a bar in Slemp, Ky., where he grilled the natives for firsthand information about folk/blues legend Roscoe Holcomb, to New Orleans, where he picked the brain of Animals frontman Eric Burdon. He met some fascinating characters along the way, but the hero of the story is musicologist Alan Lomax, who in 1937 “collected” what Anthony considers the song’s most noteworthy early incarnation, a scratchy field recording of “The Rising Sun Blues” by 16-year-old Georgia Turner. Even Lomax, who made big claims for American vernacular music, might have been surprised to see Turner’s two-minute version beget a 300-page book. Anthony spent more than $10,000 on CDs and currently owns 119 versions or derivations of the tune, including renditions by gospel stalwarts the Blind Boys of Alabama, Latin bandleader Xavier Cugat and the ever-popular Timo Kinnunen One-Man Band. His obsession may seem a little nuts, but the author makes a case for the song’s importance with such passion and skill that many will ultimately be persuaded. 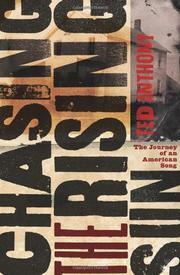 Readers may not want 119 takes of “House of the Rising Sun,” but after Anthony fills them in on its rich, complex history, they’ll probably hit up iTunes for one or two. Or maybe even ten.